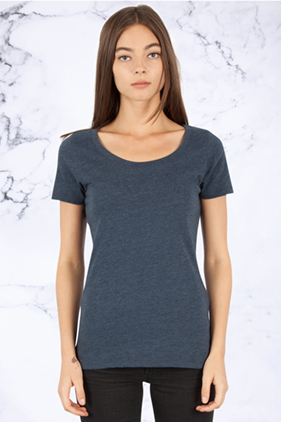 60% combed ring-spun cotton/40% polyester, 30 single 4.6 ounce women's scoop neck cvc t-shirt. Shoulder to shoulder neck tape. Side-seamed. Pre-laundered fabric. Superb fit. Tear away label. South Korea fabric. Available in solids as well as sporty heathers.